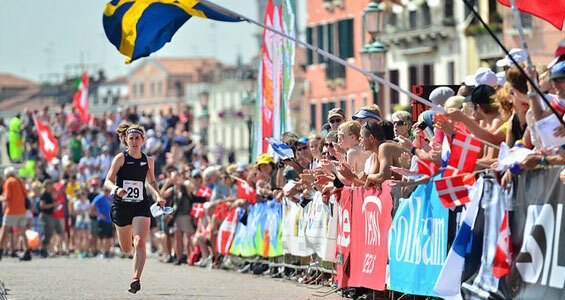 Soren Bobach of Denmark seizes the Sprint World title. Judith Wyder (SUI) has no rivals amongst women. Alexandersson (SWE) and Hubmann (SUI) wear silver. Red and white flags waving in beautiful Venice. Soren Bobach of Denmark and Judith Wyder of Switzerland took gold medals in today’s World Championships Sprint in Italy. They respectively beat overall World Cup leader Tove Alexandersson and Sprint superstar Daniel Hubmann, while Maja Alm and Tue Lassen (DEN) seized bronze. After closing in second position the qualifying round, Wyder looked like a sure winner already from the start of the final race. The Swiss finished 11.9 seconds ahead of Alexandersson, whilst Alm left back Volynska (UKR) and Eliasson (SWE). In the men’s class, Bobach came in tenth in the qualification heat, but his final race was simply flawless. The Dane eventually crossed the finish line 2.1 seconds ahead of Hubmann. Along with the WOC the promo event ‘5 Days of Italy’ with over 2000 participants from all over the planet started off in the morning with a Prologue in the venetian lagoon.